It’s a small world! 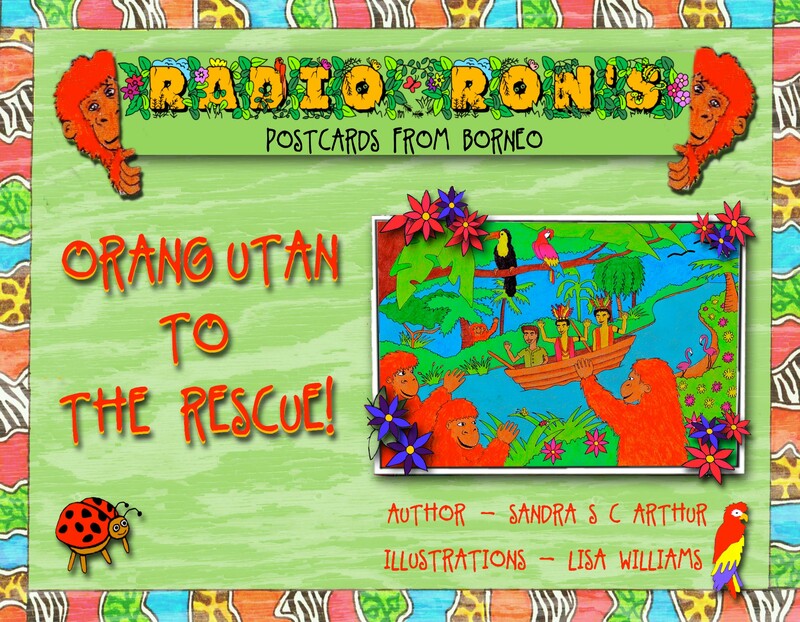 I was fund raising for the orangutans and promoting my kid’s books, Radio Ron’s Postcards from Borneo and a new historical fiction, Corporal Ron’s Borneo Warrior Rescue at an international school event in France, when my Lithuanian friend, Agne, who was helping me, told me about her “famous” relative. It turned out that her husband’s Aunt is Dr. Biruté Mary Galdikas! Dr Galdikas has studied orangutans longer than any other person in human history and has worked ceaselessly to save orangutans and forests, and to bring orangutans and their plight to the attention of the world. For almost four decades Dr. Biruté Mary Galdikas has studied and worked closely with the orangutans of Indonesian Borneo in their natural habitat, and is today the world’s foremost authority on the orangutan. I had known about Orangutan Foundation International, but never really researched the background to this charity. Having achieved my own trip of a lifetime back in December 2010, to observe the wonderful orangutans in their unique home, Borneo, how I wished I’d known about the following eco-trips with a naturalist expert, could be available. For anyone interested to learn more about the amazing country of Borneo and at the same time to see, perhaps for the last time in the wild, the wonderful Great Apes – orangutans, the Orangutan Foundation International are arranging four special trips in 2012. These shy, majestic creatures are facing loss of habitat due to deforestation, forest fires, palm oil production and illegal pet trades. A number of international charities, such as OFI are working hard to help the orangutans, but sadly it appears to be a difficult battle, as their numbers continue to decline, year after decline. There are now around 6000 orangutans left in Sumatra and figures for the whole of Borneo are sketchy with numbers estimated between 25,000 – 40,000. These four special trips in 2012 with Dr. Galdikas as your own personal naturalist, are a must do trip for anyone interested in Orangutans. Dr Galdikas will give her insights into the orangutan’s natural history and behavior and share her adventures working with this incredible species for over 40 years. Spaces for each trip are limited to 13 individuals and they will fill quickly. If you are interested in joining one of our tours please contact Irene Spencer for availability: irene@orangutan.travel or telephone number +1 619-574-1371 in San Diego, California, USA. Back in 1971, Biruté Galdikas arrived in one of the world’s last wild places, Tanjung Puting Reserve in Borneo. There were no telephones, roads, electricity, television, or regular mail service. The reserve was being logged and the laws protecting wildlife were not enforced. The rhinoceros had already been hunted into extinction in the area. At this time, very little was known about orangutans in the wild. Despite these conditions and a number of people that said it could not be done, Dr. Galdikas developed the first comprehensive study of the wild orangutan. Through this work, Dr. Galidkas created Camp Leakey, the site of the longest continuous study on any primate. She has also protected one of last havens for orangutans in Borneo despite the tremendous pressures from illegal logging and mining interests. During this trip, you will visit the sites of Dr. Galdikas’ work including her famous research site at Camp Leakey and the Orangutan Care Center and Quarantine Facility, which houses over 330 orangutan orphans. Dr. Galdikas will share with you her expertise in the areas of primatology, anthropology, and conservation. As the world’s leading expert in orangutan behavior, you will come away with insights into one of human’s closest living relatives. You will also spend time along riverways and walking through the forest in search of some of the most amazing wildlife on the planet including proboscis monkeys, barking deer, rhinoceros hornbills, and Bornean wild pigs. Having visited the northern part of Borneo, in Sabah, where I was lucky to observe not only orangutans, but also the endangered proboscis monkey and much more, I would highly recommend this trip to anyone interested not only in nature, but also for those who genuinely may be interested to help the plight of these fantastic animals.